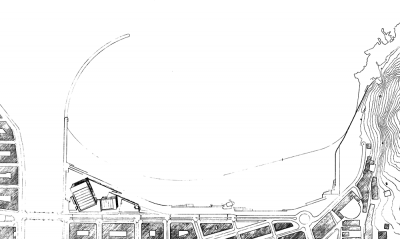 The site of the Kursaal Centre at the mouth of the River Urumea is a geographical accident and was required to remain as such. The architect therefore proposed to erect a building that would not violate the rivers presence in the city. 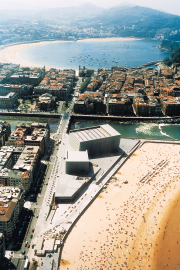 The convention centre and concert hall are conceived as separate autonomous volumes: two gigantic rocks stranded at the mouth of the river forming part of the landscape rather than belonging to the city. All other facilities  the exhibition halls, meeting rooms, offices, a restaurant, and musicians services  are located in the platform at the base of these cubes. 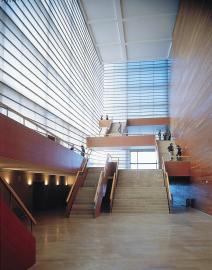 The concert hall is inscribed asymmetrically into the larger of the two prismatic volumes. 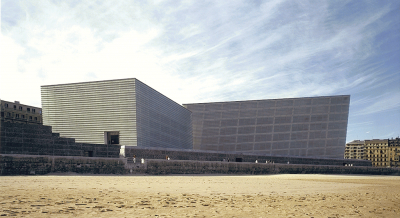 The asymmetry is oriented in such a way that visitors entering the foyer are unconsciously led towards the highest level where Mount Urgull and the sea may be contemplated from a window which punctures the building s double wall, composed of a steel skeleton clad inside and out with special, laminated glass elements. Outside, glass surfaces provide protection against salt-laden sea winds, making the volume a dense, opaque, yet changing mass by day, and a mysterious and dazzling source of light by night. 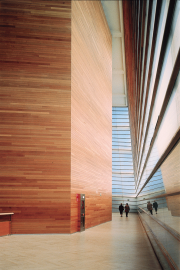 Similar design and structural criteria were applied to the smaller convention centre, which is also inscribed into an inclined prism. Though the asymmetry here is less evident, the view from the foyer of Mount Ulía and the sea in the background is just as spectacular. 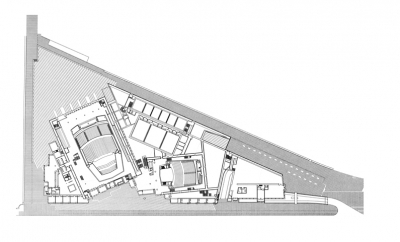 The open space of the platform below provides entrances to the auditorium and congress hall, information and ticket booths, and access to a 500-car parking structure. This plinth serves as the meeting space between the cultural centre and the city, opening onto Avenida de la Zurriola and providing a wide outdoor space for public access.